The Chinese Year of the Tiger is normally associated with forthrightness and inhibition. Those are two words which probably can’t be used to describe this pretty, if unspectacular, online video slot from developer RTG. 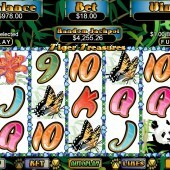 This 5 reel, 20 pay-line slot is, typically of this developer, bright and breezy with an attractive progressive jackpot. Unfortunately, other than that, there’s nothing really to write home about. Fans of Chinese culture will probably warm to the symbols, though. There are plenty of rubies, pandas, lotus flowers and Chinese characters to put you in the mood here, plus, of course, the familiar 9-through-Ace card symbols. The fluffy tiger acts as the game’s Wild, appearing on reels 2 and 4, and he substitutes for all other symbols other than the Scatter, which in this case is the Chinese glyph. A winning combo containing a tiger will see your win trebled. As I said, the Chinese symbol is the scatter, with five of the characters winning you 100 coins. When three or more scatters appear on the reels, you’ll have the chance to win anything from five to 25 free spins in the game’s only bonus round of note. 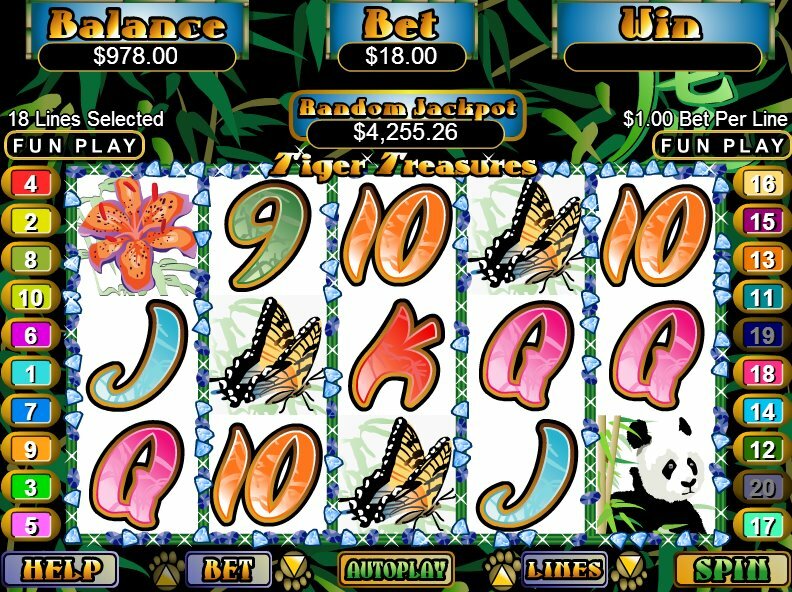 In a neat twist, however, during the free spins Wild tigers are added to reel 3, and more can appear on reels 2 and 4, to give you extra chances of winning. This feature can also be re-triggered. To be honest, though, that’s about your lot from Tiger Treasures. The ‘Treasures’ part of the title may only refer to the progressive jackpot on offer, but that alone might be enough to float your boat. Not this reviewer, though. Although pleasant enough to look at, I preferred the Asian charms of Isoftbet’s Chinese-themed Oriental Tiger. Even Microgaming’s beautiful Eastern-influenced slot, Asian Beauty gives a far more authentic experience than this.